How to stand out at your job & every day life! 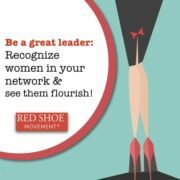 You are here: Home / Red Shoe Movement Blog / Women Empowerment Articles / How to stand out at your job & every day life! Teachers I’ve talked to tell me that in general, when they ask a question, the boys in the class are the ones that usually raise their hands. Women, from very early on, prefer to wait until they’re absolutely sure they know the right answer before risking giving an incorrect answer. Shame on these girls if they “scream” the answer without asking for permission. The teacher will usually remind them of the classroom’s rules, something that doesn’t usually happen if it’s a boy who does the same thing. Sadly, I see this attitude each time I hold one of my conferences. When the moment comes to ask me questions, most times the hands raised belong to the men in the room. In fact, in a funny illustration of this, the other day I presented in front of an audience that was 90 percent women, and one of the few men in the room was STILL the first to raise his hand! Read more ¿Qué más? Is it ever okay to lie in order to advance your career goals? Why are women so timid? It’s a combination of us wanting to feel 100 percent sure about what we’re going to say before opening our mouths, and the fact that we don’t want to seem dumb by asking something that perhaps others might consider obvious. Men, on the other hand, just wing it without as much thought and with less trepidation, and as a result they get more attention and more visibility. Do you remember how teachers often paid more attention to your rowdy, problematic schoolmates than to the studious, smart girls in the class? They were working under the assumption that the girls–at least the more dedicated ones–could go at their schoolwork on their own, while the boys needed their help. The same is true in our professional lives. When you ask a question or make a comment in front of a large group, you make yourself known. You have the opportunity to state your name, the company or department you work for, and you get to ask something that will showcase your intelligence, knowledge, or interest in a particular topic. It’s also a great way to get noticed by potential mentors or advisors. It’s a strategy that has always given me results when I attend any conference where I can find potential clients. Without fail, after asking something relevant, people approach me asking me for my card and telling me they’d like to speak to me. I’m not saying by any means that it’s easy to put yourself in this situation. But the truth of the matter is that with the way the job market is these days, if you don’t cast aside all those notions of what is and isn’t comfortable for you and if you don’t put yourself out there to be noticed for the value you add to any job, you could easily become a target when the next rounds of layoffs come around. So, do your homework, prep before any work event in which you know there will be a Q and A session so you could have a really smart, relevant question ready. Or, try to think of one during the presentation and make sure you’re one of the first people to raise their hands and talk when the moment comes. 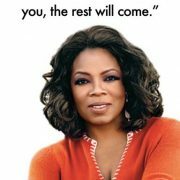 You’ll stand out from the group–and you’ll open many more doors than you can even imagine! 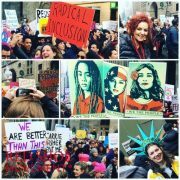 This article was originally published on Mamas Latina. 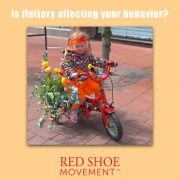 https://redshoemovement.com/wp-content/uploads/2017/02/RSM-logo-website.png 0 0 Red Shoe Movement https://redshoemovement.com/wp-content/uploads/2017/02/RSM-logo-website.png Red Shoe Movement2013-01-01 17:12:322014-05-02 16:31:30How to stand out at your job & every day life! 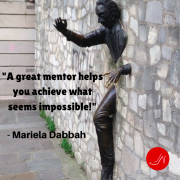 Mentoring Quotes to Inspire You- Share Away! Is flattery interfering with your career goals? This story is a wake up call!